45902, "New feature! Chat with your orkut friends." 45905, "Change how your orkut friends are shared with Google Talk." From the other side, here's an example of mail invitation from orkut. Your orkut friend, [email], would like to chat with you using Google Talk. Google Talk is a downloadable Windows application that lets you chat, make free voice calls, and share files with friends inside and outside your orkut network. Now, it's easy to add your orkut friends to your Google Talk friends list. You'll see their chat availability in orkut, and you can even send scraps (and get scrap notifications) right from Google Talk! 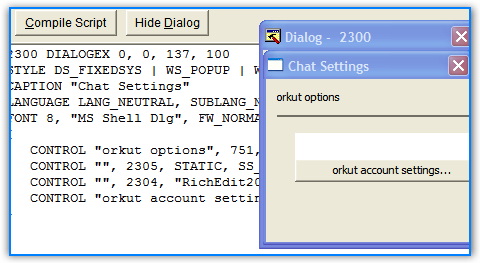 But if you want, you can disable Google Talk's integration with orkut. All I'm getting in Orkut is Spam from Brazil, none of my friends is using it any more? I'm confused. I've been trying to get into Orkut since reading somewhere that Gmail users can now log in, but I'm still getting an "invitation only" message. Is it or ain't it open? And if it's still closed, does anyone have an invitation for lil ol me at "will (_at_) irace.net" ? Some people from India could get into orkut without invitation. I guess it was a limited experiment. Of course, what they should really improve in Orkut is the fake spammer profiles. They finally launched this. Login to www.orkut.com and see for yourself. Go under settings. I see online icons for my current friends. cool! I am getting the same problem. I canot join Orkut until I am invited. Can anyone send me an invite?